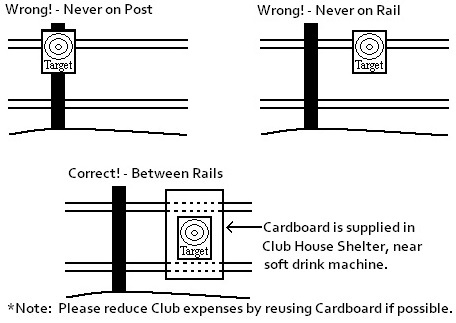 Cardboard backers are supplied in the Club House shelter, near the soft drink machine. 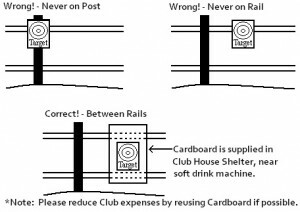 Please hang targets so that you are not shooting into the target posts or rails. All targets must be suspended from the target frames so that the line of sight through the target is in direct line with the earthen backstop berms. No target shall be hung or placed in such a manner as to permit a projectile to strike the ground or miss the backstop. Violation of this basic rule has serious consequences and will not be tolerated by Club management. All movable or portable target frames must be positioned within 3 feet of the backstop to assure bullet impacts the berm. Please remove all targets when you are finished. Reuse cardboard backers if possible to help reduce costs.